This event is held in June each year, and has over 300 classes in the bench show, where exhibitors compete for approximately $3000.00 in prizes. On display are flowers, fruits and vegetables, baking, photography, art and crafts. Junior exhibits are a highlight. The Wainwright Arts Festival is hosted annually at the Wainwright and District Communiplex during February. The Arts Festival includes a literary night, which features local poets and writers, giving them the chance to get up and read their work in public. The Art Show and Sale has been a huge success with a growing number of artists showing their paintings, drawings, metal art, jewellery, wood carving, stained glass and photography. Local musicians also play during the art show, adding to the atmosphere. History is best experienced at the Bodo Archaeological Centre – one of Alberta’s largest and most well-preserved. A unique area of stabilized sand dunes and grasslands inhabited during the past 5,000 years by Aboriginal hunters and gatherers, you’re bound to stumble upon enough bison bones, pottery and stone hunting tools and arrowheads to leave you with a humbled sense of wonder and delight. After the turn of the century, Howard Douglas, Superintendent of Buffalo National Park can be credited with pushing the Dominion government to purchase the largest and one of the last plains bison herds on the continent. In 1907, the government created Buffalo Park on 160 square miles of land adjacent to Wainwright and stocked the area with several hundred head of buffalo purchased from Montana rancher, Michel Pablo. Under protection, the herd grew to such an extent that annual round-ups began in 1922 to reduce the population of the herd. From 1922 until 1939, the herd was rounded up annually and culled and, from 1925-1928, shipped north to Wood Buffalo National Park. In 1923 the Hollywood movie “The Last Frontier” was filmed at Wainwright. The Park Riders were used as stunt men and extras. Buffalo were also shipped to zoos and parks all over the world. The round-ups continued until 1939 when all the buffalo were removed and the park was turned over to the Department of National Defense (DND) for use as an army training facility. Today the DND maintains the “Bud Cotton Buffalo Paddock” located at the entrance to Camp Wainwright. Opened in 1980 four yearling bison were donated by the Superintendent of Elk Island National Park to commemorate the plains bison saving effort at Buffalo National Park (1909 – 1939). The military base continues to maintain this bison herd housing approximately 20 buffalo as a reminder of the history of the park. Deemed ‘Canada’s largest buffalo', Wainwright’s Buffalo Statue and symbol was erected just off the highway on Main Street in July 1965 in memory of the great buffalo herds that roamed Buffalo National Park. The statue was unveiled at a ceremony attended by many townspeople and visitors including a group of men who rode range in the buffalo park, or took part in its operations. Chief of these was Bud Cotton who came from Calgary and gave an interesting address and did the actual unveiling. Many dignitaries were introduced including the man who actually made the buffalo, Heiko Hespe. A modern facility with seating for 300 located in the Wainwright and District Comuniplex; features a professional grand piano. Theatre 75 , a local theatre group puts on several outstanding productions each year including both well known, and locally written plays. Encore Entertainment society brings in various professional acts throughout the year. We invite you to explore the Culinary Trail to experience and celebrate the food culture in East Central Alberta. Visit Eat East of Edmonton for your guide to some of the province’s most unique and exciting culinary attractions. Since 2000, the Town of Wainwright has partnered with the Alberta Main Street Program and the Alberta Heritage Resources Foundation who have granted hundreds of thousands of dollars to preserve and protect the historic downtown centre. This partnership has resulted in numerous studies and strategies to preserve and revitalize the downtown core. The Wainwright Main Street Project continues to flourish with major restorations of the Old Town Hall, Wainwright Hotel and the CN Station. Contact M.D. of Wainwright for more information. The Memorial Clock Tower was built to honor those who lost their lives in the First World War and later to include World War Two. Each Remembrance Day, citizens of Wainwright along with the Royal Canadian Legion, gather around this memorial and pay tribute to those who fell in the wars. 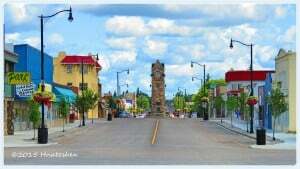 The Memorial Clock Tower was the only structure left standing after the worst fire in the history of small town Alberta swept through Wainwright destroying 70 businesses and 8 homes in the summer of 1929. Described as a “Roman tower”, the monument was designed and built by Frank Bailey. The clocks in the tower were purchased from Gillett and Johnston, Croydon, England. The bronze tablet set in the masonry, which lists the dead, was designed by Morris Norburg, Edmonton. In homage to the oil industry that was such an important part of Wainwright’s history, a dedicated group of volunteers are working to restore and house one of Alberta’s first pump jacks that will be displayed in Petroleum Park as a proud memorial to the oil industry’s contribution to Wainwright and the Province of Alberta.The Pump Jack is visible to all along Highway 14 and as such enhances tourism in our area as it relates to Alberta’s most valuable industry – oil. The oil industry continues to be important to Wainwright & District and this artifact has an economic benefit to business in the community because it speaks to the long history of heavy crude in our district and the Province of Alberta. The Pump Jack Project includes revamping the whole of Petroleum Park which is an entrance point to our community and thus adds not only to neighborhood improvement but also to the look of the Town of Wainwright & District. The Pump Jack is an important example in Alberta of the first oil pumps installed in the province that existed during the period of the late twenties and the early thirties. The Pump Jack has cultural value to the community and to the province of Alberta. It is valued for its historical, aesthetic and cultural values. The heritage value of the Pump Jack lies primarily in its association with the early oil industry in Wainwright. The Wainwright Railway Preservation Society collects and preserves artifacts reflecting the history of Canadian National Railways and its predecessor, the Grand Trunk Pacific Railway Step aboard antique railcars and see for yourself how the settlers traveled. Discover the origins of Wainwright and countless other prairie towns made possible by the railway which arrived in 1908. Go back in time as you smell the old paint and examine the extensive collection of authentic rail artifacts in the passenger car. Hear stories from the conductor of the adventures of bringing buffalo to the area from Montana, as you climb in the cattle car. And don’t forget to explore the uniquely Canadian collection of railcars including two snowplows, a cab-less locomotive and a Road Switcher. Situated on a nine acre site adjacent to CN's main line, Wainwright Rail Park captures a glimpse of Canada’s railway tradition through the real life depiction of a working rail yard where modellers and enthusiasts can picture the shape of things railroad from the near and distant past. Located in the Village of Edgerton, a short drive from Wainwright, this brewery has various craft brews on tap. Visit Ribstone Creek Brewery for Taproom and Brewery Hours. September is the annual Scarecrow Festival, stuff your scarecrow and compete for the top prize! July is a food lovers delight…taste a bit of rural culinary pleasure at the Taste of Wainwright. At 2775 feet long and 195 feet high, located approximately 3.5 miles northwest of Wainwright on Highway 14 and 3.5 miles west on township road 45-2, this historic railway trestle overlooks the Battle River and can be partially seen from the Fabyan Campsite. The Railway Trestle, built in 1908, was the longest freestanding trestle in Canada during war time. A man was required to walk across it previous to the train every time there was to be a crossing. Grand Truck Pacific began construction of this magnificent structure in 1907 and was completed December 10th, 1908. It is the second largest in Canada, with Lethbridge Trestle being the largest. The first train across was January 1909. The total cost of the trestle was $600,000.00. New in 2000, the Way of the West Society created a rest area and look-off site to overlook the trestle. From this area you can enjoy the beautiful view of the Battle River Valley as well as watch trains cross the trestle. The Wainwright and District Museum originated in 1984 under the leadership of the Battle River Historical Society. Through donation the Museum collection has gradually grown and now houses hundreds of documents and artifacts. The old Alberta Government Telephones building was the home of the Museum for the first decade but became crowded and began to deteriorate beyond repair. It was not until 1983 that the Museum found a new home when the Town of Wainwright provided the society with the basement of the R.C.M.P. building rent free for two years until a more permanent facility could be found. It was in 1983 too that the Battle River Historical Society was incorporated under the Societies Act of the Province in Alberta. Now strategically located in the CN Station in the centre of the historic district, the Museum boasts exciting displays, a gift store and a restaurant and along with the historic buildings and the Rail Park, stand as the main tourist attractions in the Town of Wainwright. The objective of the Wainwright and District Museum is to collect, conserve, display, research and interpret the artifacts or documents related to the surrounding region. As a result, the Museum has constantly strived to learn more about events that have shaped the past with the aim of transposing this information into both interesting and informative displays. 780-842-3115. 35,000 items including books, video and audio tapes, computer CDs, and childrens books and tapes. Services and programs offered include public internet access, story time for children, moms and babes classes, adult information nights, no school Fridays, summer reading, guest speakers and authors, delivery service to seniors, and provision of low vision aids.